Honesty and simplicity are the two words that come to mind when you think about the Essence range of essential oils by Isagenix®. If you haven’t already noticed that theme in our essential oils toolkit, then you’ll notice it in our variety of blends. Each blend is specifically designed to create unique aromas that can only be achieved with the purest oils we have to offer, and Content™ is the perfect example. Content has been expertly formulated with copaiba, orange, grapefruit, bergamot, eucalyptus, juniper mandarin, lemongrass, citronella and cinnamon bark. What does all that mean? This aromatic blend is designed to promote feelings of satisfaction and comfort and Content’s emotionally uplifting and relaxing nature is perfect to support your lifestyle. Inhale it directly from the bottle two to three times immediately after eating to enhance feelings of Satisfaction! Or enjoy by adding to your IsaLean™ Shake or Cleanse for Life™! 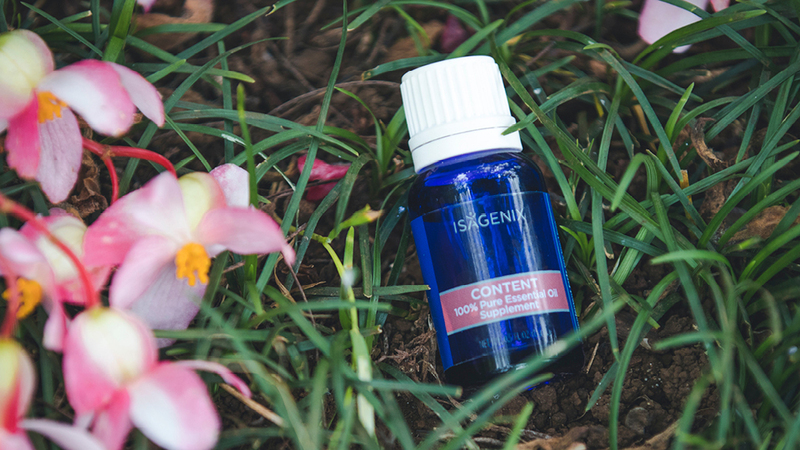 Just like with all our other products, Isagenix provides a No-Compromise Commitment with our essential oils. We’re proud of our oils and we know that whether you’re trying our amazing singles or blends, or you’re loving a collection, you’ll experience the purity and quality that our scientists have worked so hard to create. Keen to try Content or another single or blend? Order through your Back Office or the IsaLife™ app.